Ready to start your application development? Check out these main steps on your journey to publish apps in the Marketplace. Not long ago, there was no easy way for third parties to innovate at the terminal level. The process of developing and deploying an application or a service at the terminal was very cumbersome, with no standard frameworks or APIs to interact with the payment flow. As a result, developers were compelled to integrate with outdated technology that not only limited what they could do, but also restricted their reach to a small number of merchants. Verifone’s solution for the Commerce Apps allows applications and value-added services (VAS) to be added to the terminal, providing services that are both contextual and relevant. Furthermore these applications and services do not require certification, Verifone will just run a lightweight application review before applications are published in the Marketplace. This has been achieved by the novel implementation of the secure Runtime and the Payment Application that leave the 3rd party Commerce Applications outside of the certification requirements. This will allow app developers to manage their own schedule to publish the apps without the need of going through costly and time consuming certification process. The Standard Android Studio IDE with Commerce Applications SDK plugin is used for application development, and both are used for the Android Commerce (as well the Terminal Commerce) applications. Windows OS 7, 8, and 10 are supported, as well as MacOS 10.9. Detailed instructions for the SDK installation can be found here. HTML apps are called Terminal Commerce Apps and will run at the payment terminal on devices like P400, or on the consumer side of Verifone Carbon. Android apps are called Android Commerce Apps, and they run on the merchant side of Verifone Carbon. Terminal Commerce Applications can be designed to be compatible with all Commerce Apps enabled terminal types, by supporting multiple UI resolutions within the same application package. Android applications running on the merchant side of Verifone Carbon can have a companion app on the consumer side facilitating merchant-consumer interaction, or they can use the Verifone-implemented Payment API to interact with the Payment Application. These applications are called dual screen Android Commerce Applications. Development of Android Commerce Applications is similar to developing standard Android applications with the Android Studio. In addition to the Google-provided APIs, you have the Verifone-provided Payment, Commerce, and Peripheral APIs available. All APIs are available in the CP2.0 release. You can test your application while you develop it. The development tools include a simulator to run your application. The simulator supports all Commerce Apps enabled terminal types. 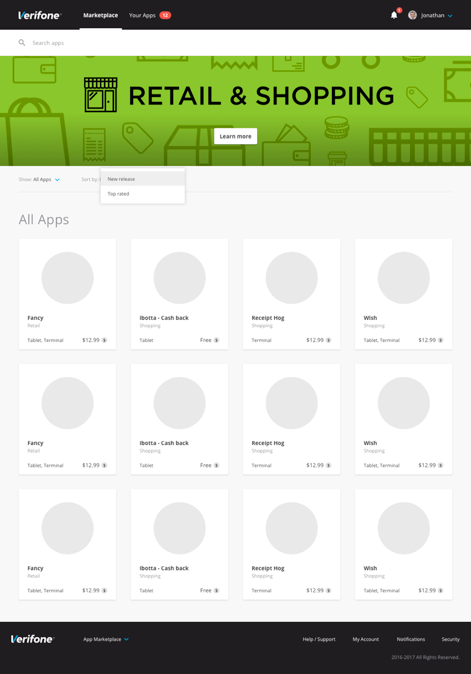 It also supports both the Terminal Commerce as well as Android Commerce applications. 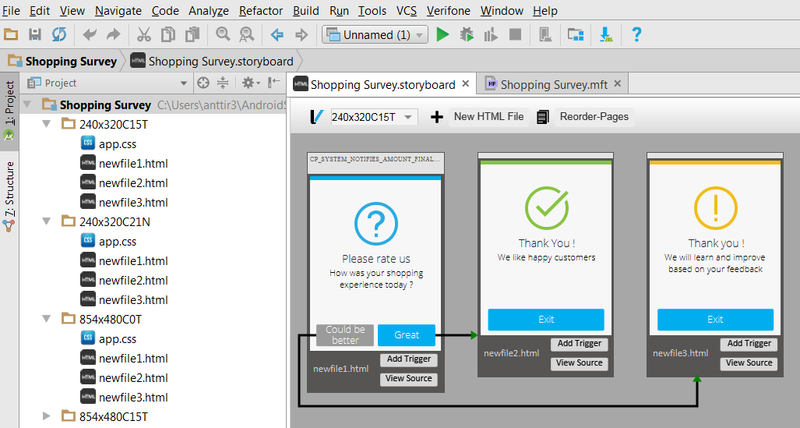 Even the Dual Screen Android Commerce applications are supported in the CP2.0. release. While running the HTTP/CSS/JS apps in the simulator, one can simulate real payment transactions by setting related payload data for the simulator. XMLHttpRequests to the cloud services are also supported. 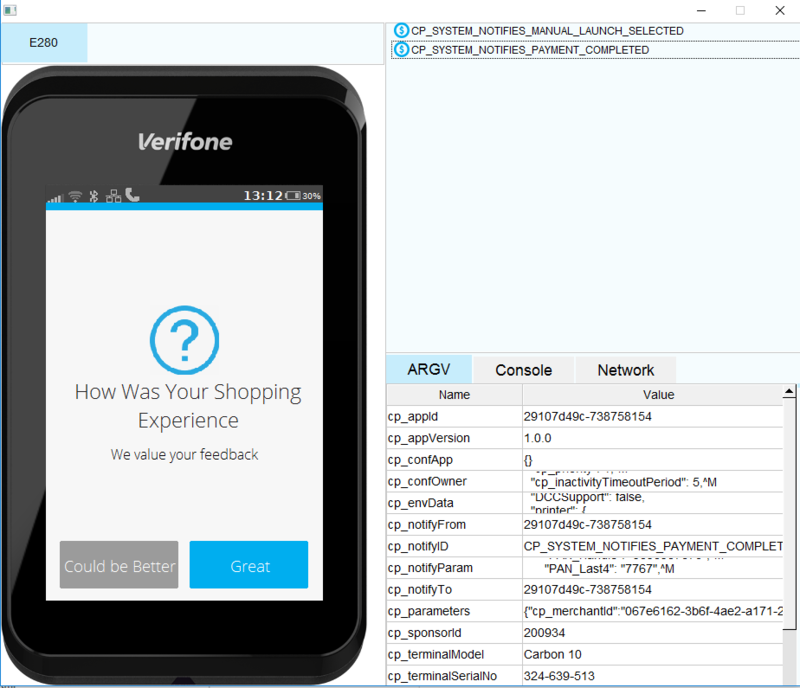 Verifone provides Developer Kits for all main HW configurations. You can check the Developer Kit availability at the developer tools -page. A Developer Kit is like a payment terminal, but you can't make real payments with it as all payments are locally authorized in the device. After you've verified your application in the simulator, you can export the application from the development tools and side load it into a Developer Kit. 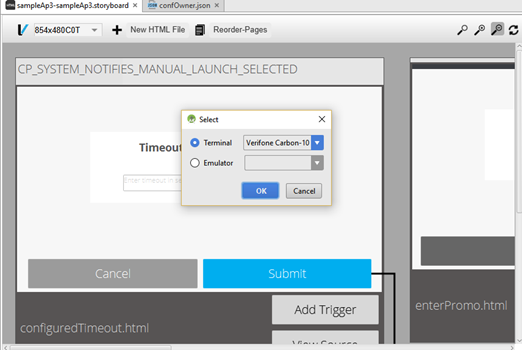 For Carbon 10 Developer Kit application side loading takes place directly from the development tools. Once you have the application ready and tested, the next step is to submit the application to be reviewed by the Developer Support team. To begin with the developer would need to register a developer account on the Developer Central portal and affiliate it with a valid company registration. The detail procedure for affiliating the company is available here. Verifone team reviews the applications which are submitted by the developers before the applications are published in the Merchant Marketplace. When developing applications, the developers need to follow provided guidelines and practices. The details of the Verifone guidelines are available here. After the application review procedure is completed and the application is approved, applications is ready to be published at the Merchant Marketplace. Verifone's solution for Commerce Apps and Marketplace transform terminals into smart terminals with industry leading applications that offer new services and experiences that can be distributed to acquirers and merchants. Registered publishers can submit their applications to be published in the Marketplace by using their developer account at Developer Central. You can request your developer account to be upgraded to a publisher account. In the application submission form, the publisher provides information needed for application publishing, like application description and screenshots. After Verifone reviews the application, it is published in the Marketplace to be available for Estate Owners and Merchants to buy and install on their terminals. Application pricing can be based on one-time fee, subscription fee or free apps. In case of free apps developer will pay a placement fee for publishing the app in the Marketplace. In all pricing models Verifone guarantees that developers will get 70% of the revenue the app generates. Access reporting dashboards to track number of app purchases, app installs, revenue, app updates, and more. We will be hosting a webinar on November 1st, 2018 to discuss this further with registered developers. Stay tuned here for further information on the details of the Webinar. Copyright © 2018 Verifone. All rights reserved.